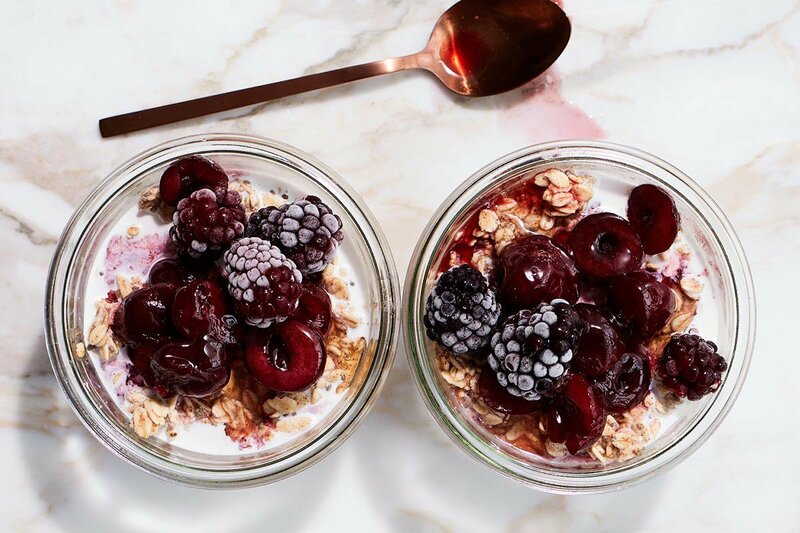 Almond-butter cherry-berry overnight oats. Photo by Johnny Miller. Today is a great day for debut book releases! In addition to our own Travel Anywhere (And Avoid Being a Tourist) , today sees the launch of Well + Good: 100 Healthy Recipes + Expert Advice for Better Living by our friends Melisse Gelula and Alexia Brue, entrepreneurs and co-founders of the essential health and wellness site Well + Good. The book is a collection recipes written by industry experts, and we especially loved this travel-friendly meal from Amanda Freeman, the fitness entrepreneur behind SLT and Stretch*d. The sweet and savory oats work as breakfast on an early flight or a healthy, energy-filled snack anytime. It can easily be made ahead to take on a plane, road trip, or any on-the-go adventure. This recipe is good for: dairy-free, low-inflammation, vegetarian, better digestion, better sleep. 1. In a Mason jar or small bowl, stir together the almond milk, almond butter, honey, chia seeds, and oats until thoroughly combined. Cover the mixture with a clean kitchen towel and refrigerate for at least six hours or up to overnight. 2. Uncover the mixture and top with the cherries, berries, bee pollen (if using), and any other toppings you desire. Enjoy. Tip: If the almond butter thickens the oats too much overnight, add 2 tablespoons more almond milk to loosen them up in the morning. BuyWell + Good: 100 Healthy Recipes + Expert Advice for Better Living for many more healthy recipes. Reprinted with permission from Well + Good. Copyright © 2019 by Well+Good. Photographs copyright © 2019 by Johnny Miller. Published by Clarkson Potter, an imprint of Penguin Random House, LLC. Amanda is a Founder & CEO of SLT and Co-Founder of Stretch*d. You can follow her on Instagram at @amandahopefreeman. She travels for her love of nice hotels and beautiful scenery.